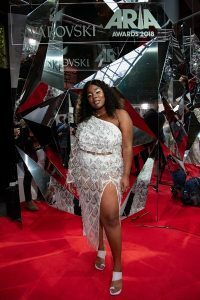 Swarovski Australia proudly unveiled its dazzling red-carpet installation as official Red Carpet sponsor for the second year running at the ARIA Awards. Taking place at The Star, Sydney on 28 November 2018, Swarovski revealed a sparkling mirror faceted installation, paying homage to the magnificent trademark crystals the brand is known for. Swarovski’s show stopping activation space was designed by David Malek, to host all the rock ’n’ roll action on the red carpet. Global superstars, Keith Urban, Nicole Kidman, Rita Ora, Troye Sivan, George Ezra and Mya were just a few who graced the Swarovski red carpet. The best of Australian talent, PNAU, Peking Duck, Client Liaison, Amy Shark, Vance Joy, Dean Lewis were interviewed by hosts Tanya Hennessey and Angus O’Loughlin on the buzzing set. Swarovski has long been affiliated with the music industry. Iconic pieces such Michael Jackson’s famous crystal glove, along with several crystallised costumes for the likes of global superstars; Beyoncé and Madonna, form an integral part of Swarovski’s rich heritage. Swarovski also hosted Australia’s leading influencers, Michael Finch, Sammy Robinson, Cartia Mallan, Flex Mami, Jayme Jo Massoud and Rowi Singh for Australia’s flagship music event. Furthermore, Swarovski hosted 24 competition winners in the exclusive Swarovski suite. The sold-out 2018 ARIA Awards, capped off an extraordinary year for the Australian music industry and showcased the talent and diversity of this year’s nominated artists.